Do your prehung interior doors stick to the jamb, rub the floor, or just don’t lock anymore? You’re not alone. This past weekend I fixed our bathroom door that was scraping the floor tile and rubbing the jamb. The door problem was most likely a consequence of our kids hanging heavy wet towels on the door handle. No worries, though. 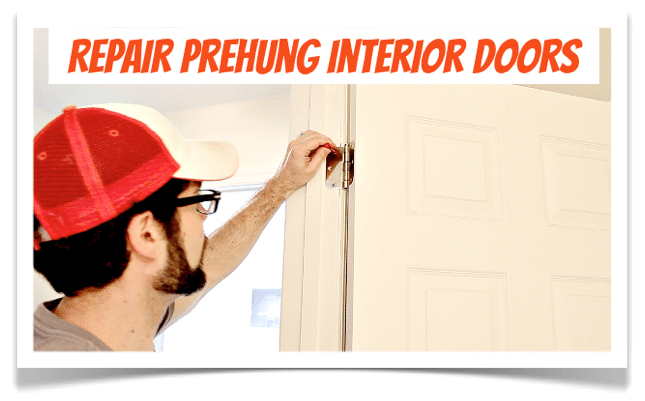 There are 4 simple ways you can repair your prehung interior door and it won’t cost you a ton of money or take a load of time. This is a super straight forward weekend project. Doors that don’t work properly are like paper cuts, annoying as all heck. By the end of this post you’ll be able to fix your prehung interior door that is sagging, rubbing, or doesn’t latch properly. This post is for Val, thanks for being a super awesome fan of HRT. The first thing you need to do is determine where your door is rubbing the floor or jamb (the vertical pieces of wood that your door fits into). All the above solutions will bring your door back to plumb or completely vertical instead of tilted one way or the other. 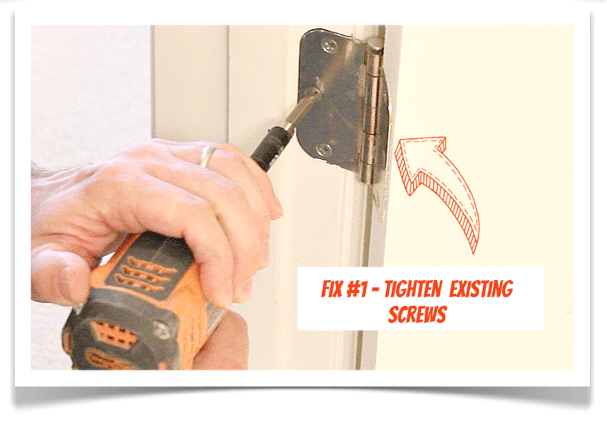 The first action you can take is tightening hinge screws and this is easy-peasy. Use your drill or impact driver to snug all the screws on the hinge that’s loose. Start with the screws that fasten the hinge to the jamb then sink the screws that fasten the hinge to the door. If during this process your screws just spin without getting tight then move onto Steps 2 & 3. See, that was easier than eating Cherry Garcia from the container. Often times the screws that come with hinges are 3/4 inch in length. This makes no sense to me since doors are usually heavy (I’m being a bit sarcastic here) and get used a lot. Replace your small screws with 2 or 3 inch wood or deck screws. They can be found at all hardware stores and will provide the extra grip necessary to keep the hinges stationary and your prehung door plumb. Employ the old golf tee trick for enlarged screw holes where the screw just spins like Dorothy Hamill. Add wood glue to the end of the golf tee that you’d stick in the ground. Slide it into the screw hole and tap it with a hammer. Then use your hammer or a utility knife to break off the tee so that it’s flush with the jamb or door. Shimming the hinges simply means adding cardboard behind them. This is a bit more involved and you’ll need to be a detective much like Magnum PI or Columbo (by the way, which guy do you like best? Magnum is super cool but Columbo had the better wit in my opinion). If you watch the video below I’ll explain how to do all the above tips plus help you determine how to use shims to stop your door from misbehaving. In order to properly use shims you need to first determine where your door is touching the jamb(s) or floor. You can use the Solution Guide from Step 1 to determine where to place the shims. For example, if your door rubs the floor next to the jamb that houses the strike plate you should put a shim behind the bottom hinge. Where do you get shims for door hinges? Take an old shoe box and cut out the bottom or cut the to top into a 6 inch by 8 inch piece (unless your feet are super small like my grandma’s, she wore a size 4!!). Unscrew one side of your hinge and slip the cardboard behind it. Trace the outline of the hinge several times on the cardboard with a pencil. I always cut inside my trace marks to make the shim a little smaller. This helps hide the shim behind the hinge. 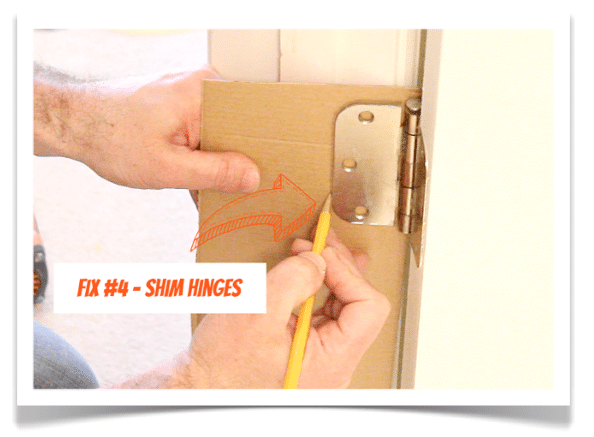 Use the least number of shims that it takes to make your door not rub the jamb or floor. Ideally, you still want the shimmed hinge to sit in the mortise. The mortise is the slot where the hinge sits inside the door or jamb. Without the mortise your hinge will likely become loose over time. 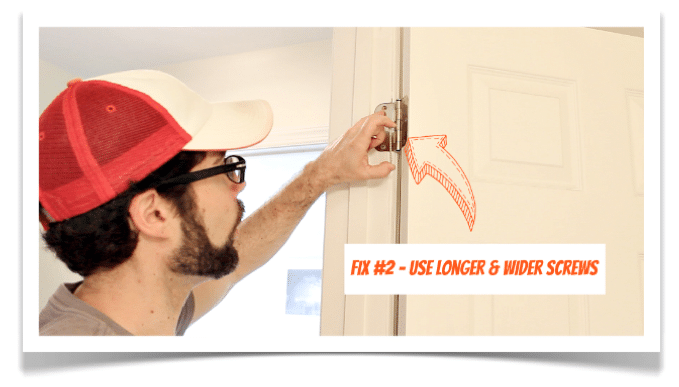 At the beginning of this tutorial you started with an irritating problem and now hopefully one of these 4 ways will help you fix your sticking prehung interior door. Admittedly, there is one more solution and that is to trim the bottom of your door. But this is a last resort and for another post. 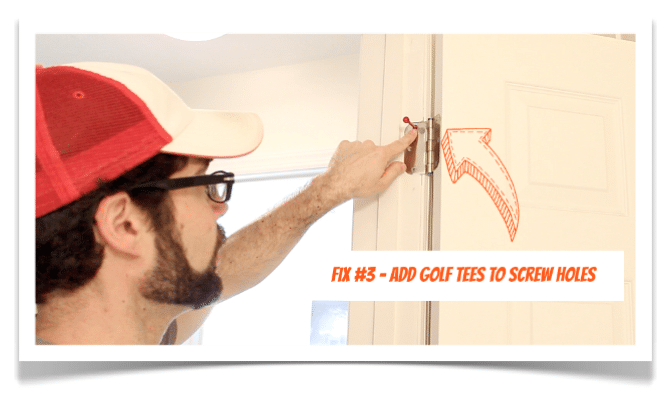 Also, if your door opens or closes we have a great tutorial showing how to fix that. I love your golf tee tip- that is brilliant! I’ve always jammed some toothpicks and glue into the hole, but your tip sounds much sturdier and less messy. Great tips, Jeff! Pinning for future reference. Thank you! You’re always welcome Roeshel. Thank you for inspiring me every week! Great tips. Shimmed the bottom hinge and door stopped scraping on tile on the striker plate side. While taking off the door, found it had 1/2″ screws! Replaced those before I shimmed and no more scraping! I have no idea why hinges come with 1/2 inch screws. It’s probably all about saving a few cents. Great job! My back door is scrapping floor and bottom of jamb (bottom right side of door). Screws are tight when I’m trying to tighten them,I’m a bit tentative to take the door off and sand some off as that will only solve floor scrape and not the jamb. Is this a hinge issue? Try shimming the bottom hinge with cardboard from a cereal box, if that doesn’t work let me know…we can figure it out. 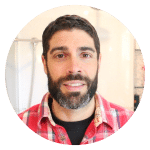 I have to say you take the scary out of DIY, I work with skirting boards and it’s hard to show people that DIY isn’t intimidating and can be very easy, but you do a great job, I’ll be recommending your blog to our customers without a doubt! Thank you for this! It helped answer some questions without coming off as intimidating! I’m off to look at my trouble doors! my door was installed too low. Do they sell enlarged jam hardware so the door will click? The interior doors in my home were purchased from a Big Box Store. They are 36″ wide, six panel pine prehung with the master bedroom bath door Giving me head aches! I installed three hooks on the bathroom side for PJ’s, tee shirts but not wet towels or heavy cloths. The door was installed nine years ago and has tilted towards the striker door latch several times. I have replaced all the short screws on both sides of the three hinges with 3″ deck screws. These screws were installed with glue and tooth picks. Also, I shimmed the door up to a level position for each repair by placing wood shims below the door from the door handle side. Each repair works for several months until I find the the door leaning again down under the hole plate on the door jam side which does not allow the door to latch shut. Any additional suggestions. Should I consider replacing the hinges at this time?